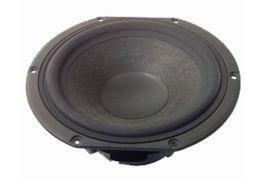 HDS-series woofer with 8″ (200 mm) NOMEX cone. Peerless HDS-P830869 features also vented die cast basket and long-throw motor with ferrite magnet and aluminium shortening ring, reducing voice coil inductance. Note: additional manufacturer's item name for Peerless HDS-P830869: AULY02008-0021.